, as his wife was from Isaan. He could also speak a bit of Mon language. A year before he passed away in Nov, B.E. 2531 at 76, he commented that it had not died by the same time the following year, he would live to be a hundred years old. However, he passed away a few months later. , as they bestowed users with an imposing aura, which strikes fear into law enforcers and helped to keep these enforcers at bay. Devotees in possession of these were said to have incredible protective powers. 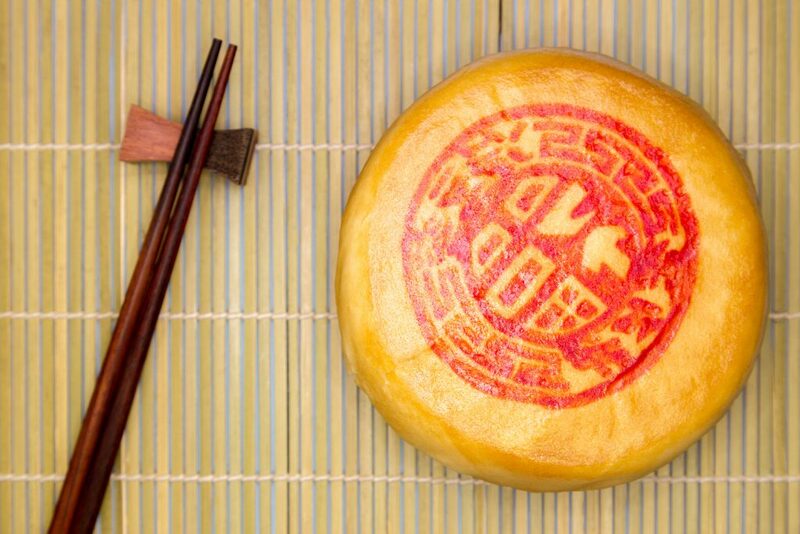 It is also known to generate wealth and abundance, in line with the Chinese symbolism of a plump pig. 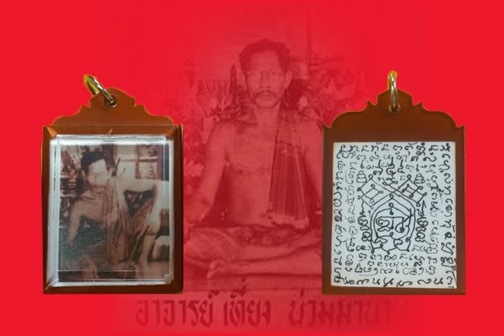 , which grants protective and healing abilities to the recipient of the sakyant. also taught him the wicha for sakyant tattooing. onto the devotees, they were startled back to their senses. It took a few moments for them to recollect their state of mind and realized that they were still in the temple. They had no recollection of the earlier events in the temple! He once returned home amidst a torrential deluge of rain. His students feared that he would be drenched. They hurriedly prepared some towels for their master, only to discover that he was totally dry, even his hair! A student wanted to visit him with food while he was hospitalized. The student, however, was unsure whether to visit his teacher or mother first. He decided to visit Phor Tiang first. Phor Tiang expressed gratitude for the food and then told his student to visit his mother immediately. His student was astounded, as he had not mentioned his mother at all. 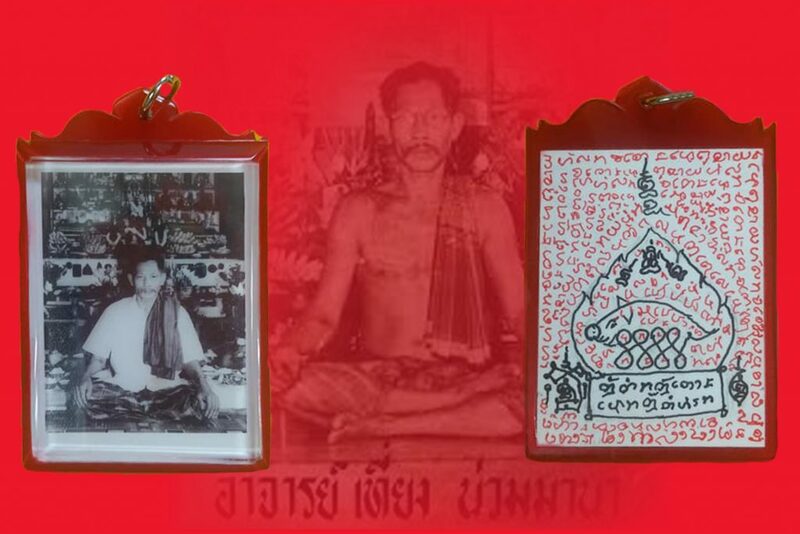 A naysayer who did not believe in ghosts challenged Phor Tiang to prove their existence. 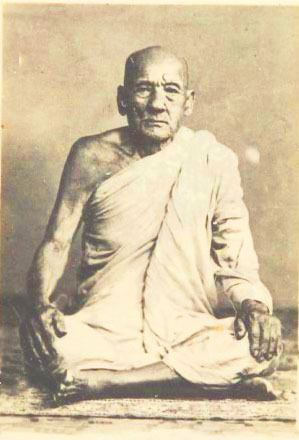 Phor Tiang told him that there might be a way to convince him and brought him to a place called Pachar. During the visit, the man encountered terrifying things and fled for his life before falling ill.
, and he agreed. 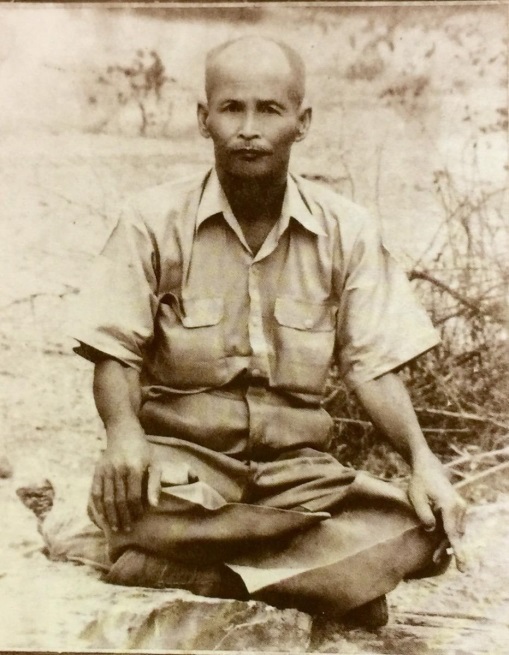 Midway through the journey, Phor Tiang had a heart attack, and the luksit wanted to send his teacher to the hospital immediately. Phor Tiang stopped him and insisted that they attend the ceremony. 2 hours later, after the ceremony had ended, Phor Tiang finally sought medical attention. Phor Tiang explained to his luksit that a man should always keep his word, and fulfil whatever he had promised, no matter what. Phor Tiang once travelled outside of Bangkok to visit his student. 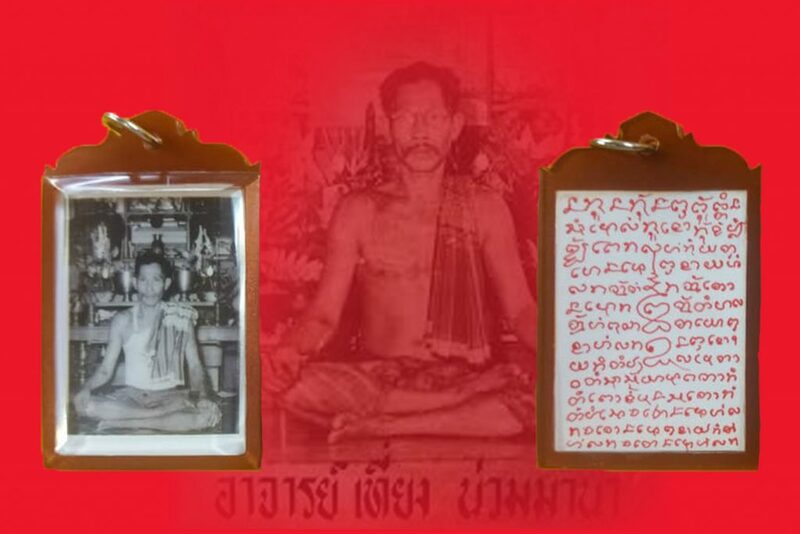 In his student’s hometown, there was a kalawat Ajarn who was adept at wicha and sakyant. 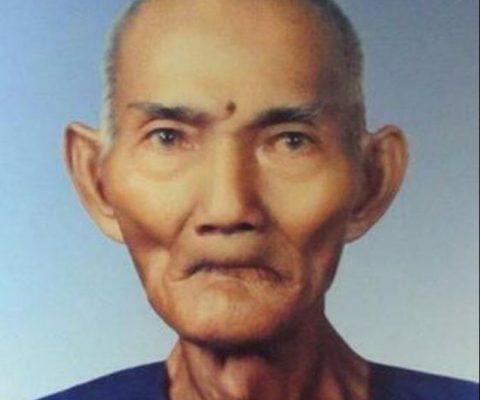 Upon hearing that Phor Tiang had come to the village, the Ajarn misunderstood his intentions, believing that Phor Tiang had come to challenge him. He insisted that Phor Tiang meet him face to face. At the meeting, the 2 Ajarn reached a complete stalemate, each refusing to back down. Not wanting to continue the discussion further, Phor Tiang said; “Stop me if you can” and stood up to leave. When he tried to pursue him, the resident Ajarn found himself completely unable to stand, paralysed by the strength of a spell cast by Phor Tiang. ”. The monk once again raised his palm and smashed the cup to bits. This time, however, the shrapnel from the cup embedded straight into the monk’s palm. 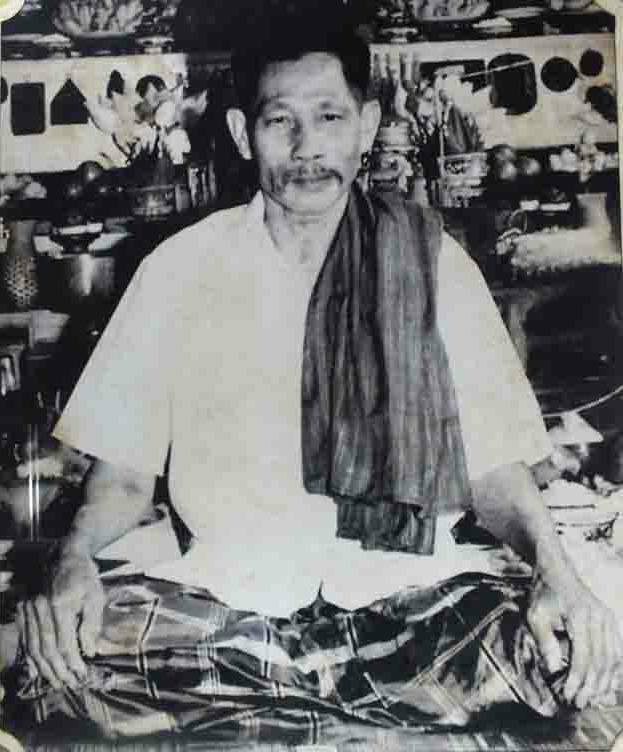 Even till this day, Ajarn Phor Tiang remains famous and well respected, particularly among Sakyant and Wicha enthusiasts. Photos sponsored by GMC Lee.